A pair of linen pockets, embroidered with wool, from the Victoria and Albert Museum. Recently I decided to make an 18th century pocket, and – after a little deliberation – I thought I should make a second one to match. Although there are many extant examples of a single pocket, I thought a pair might be useful. However, pairs of pockets were often not an exact match, as we generally desire today. They were often stylistically similar, but featured different arrangements of flowers in essentially the same design. These pockets were not sewn into women’s gowns as they are often sewn into garments these days. Instead women had a pair of pockets – or a single pocket – attached to some ribbon or tape which was tied around their waist. The pockets were rather voluminous and were reached through a hole in the side of the skirts of the dress. Once fashions changed at the end of the 18th century – with the popularity of the long, clingy dresses of the Regency – these large pockets were dispensed with in favour of the hand-held “Ridicule” or reticule. However, there is evidence to suggest that these larger pockets were still widely used, though possibly more by the older generation. I have even seen Regency “versions” of the tie-on pocket, which were smaller and easy to access through the front seams of a bib-front dress. A pair of cotton and linen pockets, embroidered with wool, from the Museum of London. I have never really considered the necessity of making a pocket for my 18th century costumes before, but there are some great reasons to do it. Firstly, it gives you somewhere to hide your mobile phone and a purse! It is also fantastic for easy access to a fan while you are dancing. Secondly, it can be a really quick and easy project to whip up, especially if you are wanting a plain pocket. 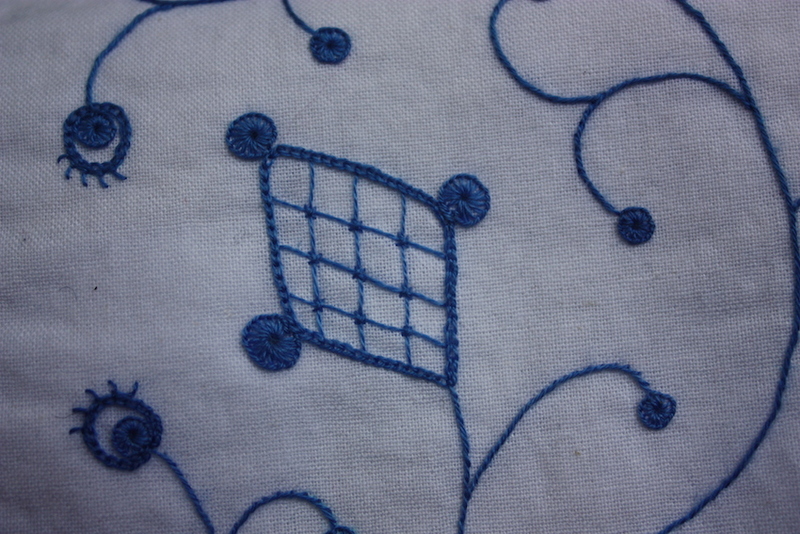 But it also gives some creative scope for the embroidery of a smallish project (by historical standards, anyway!). I used the same pattern and construction process as I had used on my first pocket. As with my first pocket, this one was made with white cotton broadcloth and bound with printed cotton quilting fabric. The design was embroidered with cotton DMC thread (No. 798). The tie was made from a length of cotton tape (25mm wide), made long enough to tie around the waist. This project was hand embroidered and hand sewn. Stem stitch – used for all the curvy stems. Buttonhole pinwheel – used for all the “berries”. Double feather stitch – done diagonally as a filling. Fishbone stitch – used for leaves. The central flower, a carnation, embroidered with backstitch, seed stitch and satin stitch. This flower is embroidered with chain stitch, backstitch, buttonhole pinwheels and seed stitch. This flower is embroidered with blanket stitch, backstitch, running stitch, satin stitch, chain stitch and double feather stitch. This flower has been embroidered with chain stitch and french knots. This flower has ben embroidered with chain stitch, long and short stitch, running stitch and a buttonhole pinwheel. This flower is embroidered with buttonhole pinwheels, chain stitch, and square laid filling stitch. The second pocket took a lot longer to finish than the first, largely because I had less time spare to sit and embroider. But I still managed to get the entire project finished within three months, which is pretty good. The great thing about these pockets is that, when they are tied around my waist, my hands can reach right to the bottom of them to easily grasp any item that sinks there. Now I just need to make an 18th century dress with some pocket holes!